When the invitation goes out around my house for a special dessert, linzer torte is always near the top of the request list. Linzer torte is a classic Austrian pastry that comes from the town of Linz, which is located about midway between Vienna and Salzburg. 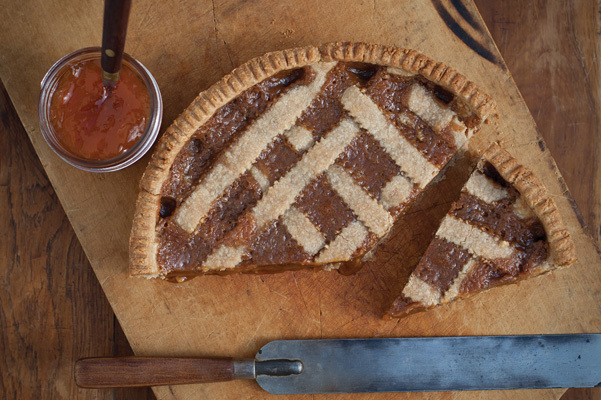 I use the traditional buttery ground-almond pastry dough for the shell and lattice topping, but instead of filling it only with preserves, I use a scrumptious blend of apricot preserves and Classic Caramel Sauce. If the pastry dough breaks when you are placing it in the tart pan or when making the lattice topping, simply patch it where necessary with a pinch from the excess dough. To get clean smooth servings, cut the slices with a serrated knife. Photographs by Alexandra Defurio fromCaramel by Carole Bloom, reprinted with permission by Gibbs Smith. Pastry Dough: Briefly pulse together the flour, almonds, sugar, cinnamon, and cloves in the work bowl of a food processor fitted with a steel blade. Cut the butter into small pieces and add to the mixture in the food processor. Pulse until the butter is cut into very tiny pieces, about 30 seconds. Use a fork to lightly beat the egg yolks in a small bowl. With the food processor running, pour the egg yolks through the feed tube. Process the dough until the mixture wraps itself around the blade, about 1 minute. Shape the pastry dough into a flat disk and tightly wrap in a double layer of plastic wrap. Chill in the refrigerator until firm before using, 3–4 hours. the pastry dough against the bottom and sides of the tart pan. Trim off any excess dough at the top of the pan. Transfer the tart pan to a baking sheet. Caramel-Apricot Filling: In a large bowl, whisk together the caramel sauce and apricot preserves. Spread the filling evenly on the pastry in the tart pan. On a smooth, flat surface, roll out the remaining pastry dough between sheets of lightly floured waxed or parchment paper to a rectangle about 12 x 6 inches. Carefully peel the paper off the top of the dough. Use a fluted-edge pastry wheel to cut 1⁄ 2-inch-wide strips of the dough. Use a long-handle offset spatula to wedge underneath each strip of pastry dough and gently transfer it to the top of the linzertorte. Make a lattice by laying the strips in a woven pattern, first in one direction then in the other direction, alternating as they are placed. Roll remaining dough into a long rope about 1⁄4-inch thick. Place this around the top outer edge where the ends of the lattice strips meet the edge of the tart. Use a fork to press the rope into the edges of the tart and make a pressed design. Chill the linzertorte for 15 minutes before baking. Position a rack in the center of the oven and preheat to 375˚ F. Bake for 30 minutes, until the pastry is set and the filling is bubbling. Remove the pan from the oven and transfer the tart pan to a rack to cool completely. Remove the sides of the tart pan and cut the linzertorte into 12 equal slices. Serve at room temperature. Keeping: Store the tart tightly wrapped in aluminum foil, at room temperature, for up to 3 days. Streamlining: The pastry dough can be made up to 3 days in advance. To freeze for up to 3 months, place the wrapped pastry dough in a freezer bag. Label and date the package. If frozen, defrost it in the refrigerator before using. Troubleshooting: Once the pastry dough is unrolled into the tart pan, don’t push it down forcefully. This will stretch the dough, which will shrink as it bakes.